I've found myself going to the zoo all the time to take pictures lately. I love animal subjects. 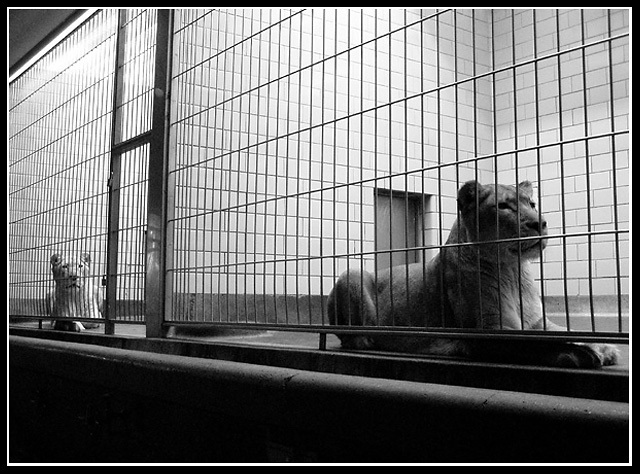 I wish I was living in an area where there were animals to photograph that weren't behind bars. I feel so bad for them and I tryto incorporate my feelings into my pictures. You did capture the pain of it. It's so cruel. Congratulations on a very emotive photo... Your view of symmetry in this photo is quite interesting and powerful at the same time. The mood in this image that you have created with the composition and the choice of sharp contrast black and white seems to support your feelings very strongly. The title "Life" seems to sum up the scene in a simple and elegent word. The "life" of these cats also seems to be summed up by the mood you created here with the lighting and the black and white. Great black & white shot. Nice composition & cropping. Good job. Of the three best phtos in this challenge, this was the lowest placed: you're a victim of the symmetry obsessives, and thos wwho can't be bothered to read the challenge instructions. never mind, it remains a fabulous photo. The others, by the way, placed 72nd and 101st - so your in pretty good company. edit: obviously, by 'best', I mean IMO. Message edited by author 2003-04-08 14:28:41. Nice work - I like the symmetry offered because it's a little different, but still very obvious. This is a very special photograph. I fear you won't do all that well, but I hope I'm wrong. I think it's exactly the kind of thing the challenge was after, and on top of which it's a very moving image. Good luck. Classic symmetry. You were able to capture some life in their faces - very hard in these conditions. I'd say more "lack of life" but photo is well done. Neat subject. Not totally symmetrical but cool picture. I like the subtle symmetry with the cats. if they only had thumbs there's no way they'd let us get away with treating them like this. ten for you. Proudly hosted by Sargasso Networks. Current Server Time: 04/23/2019 01:54:48 AM EDT.